PoPville » Dear PoP – Who Stickered my Car!?!? Dear PoP – Who Stickered my Car!?!? 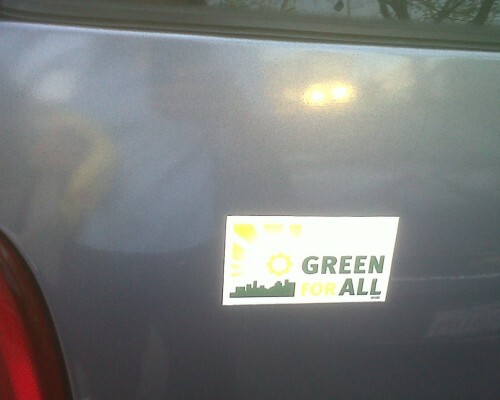 Some time in the last couple of weeks, some jerk put two “Green For All” stickers on my car. (I can’t say when exactly it happened as I was out of town, and my spouse is not the most observant individual.) I saw at least one other car on my block that had been stickered as well. I’m pretty angry about it. Those suckers are not coming off. The more I think about it, the more it seems like it was a sanctioned stickering. Dumb destructive punk kids would have put the stickers on the windshield or someplace equally obnoxious. The ones on my car are placed neatly on the trunk, one on each side, just as you’d put them yourself, if you were the stickering type. Which I am not. Holy cow, this is straight up criminal. Did this happen to anyone else?